Sprint plans to shut down the Nextel Network next year. NEW YORK (CNNMoney) -- The Nextel chapter of Sprint's disastrous 2005 merger is just a year away from coming to a close. Let's call it a mercy killing. Sprint Nextel (S, Fortune 500) said Tuesday that it plans to shut down the Nextel network as early as June 30, 2013. Sprint has long talked about its intention to wind down Nextel, but this is the first time it has offered up a precise end date. The $36 billion "merger of equals" never came together as Sprint and Nextel planned. Nextel's network ran on a different technology than Sprint's, making it difficult for the combined company to optimize its wireless infrastructure assets. Sprint had to put its radios on all of Nextel's towers, and vice versa. Nextel's push-to-talk technology grew less popular over the years, and customers have been fleeing the network in droves. Though 5.4 million customers remained on Nextel's network as of the end of March, Sprint has been transitioning them off it. The problem is that many aren't sticking with Sprint when they leave. Last quarter, Nextel lost 455,000 contracted customers, and only 228,000 rejoined the Sprint-branded service. Sprint wrote down $543 million of Nextel's value last quarter. That's just another drop in the bucket compared to the $29.7 billion writedown it took on the Nextel brand in 2008. Virtually all of the the merger's value has now been written off. 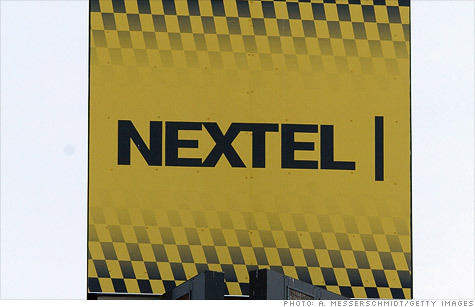 Getting rid of the Nextel brand is part of the company's "Network Vision" transition, a battle plan aimed at vastly simplifying Sprint's network technology portfolio and freeing up precious wireless spectrum to keep pace with Verizon (VZ, Fortune 500) and AT&T's (T, Fortune 500) 4G rollouts. Sprint plans to use the freed-up spectrum from scrapping its "2G" Nextel network to launch a 4G-LTE network. It hopes former Nextel customers will begin to use Sprint's new "Direct Connect" technology, which enables push-to-talk capabilities on Sprint's network. Though the company has already stopped selling Nextel phones for consumers, it will discontinue them across the board over the next few months. Sprint plans to formally notify its business and government customers later this week that Nextel will be shut down. It will simultaneously advertise Direct Connect as a lure for them to stay with the company. A company spokeswoman declined to comment on whether shutting down the Nextel network would end the Nextel brand altogether. Sprint Nextel could end up ditching the second half of its name -- shedding one of the most prominent reminders of its failed $36 billion dream. Did Apple save Dr. Dre and Jimmy Iovine just in time?